"I don’t know what it is. I like to call it fusion, just to piss people off.” Wilco's Nels Cline discusses how his wildly eclectic new album with Julian Lage and the Nels Cline 4 came to be. Nels Cline is best known to mainstream rock fans as the lead guitarist in alternative ensemble Wilco, but he also keeps up a ridiculously busy schedule of jazz, improvisational and avant-garde music projects. 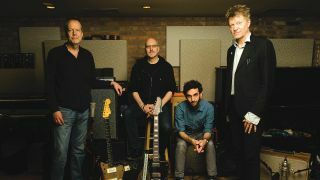 His newest is the Nels Cline 4 — a quartet that also features guitarist Julian Lage, bassist Scott Colley and drummer Tom Rainey — who have just released their debut album, Currents, Constellations.